30th ANNUAL LSU ALUMNI CRAWFISH BOIL!! SATURDAY, MAY 4th, 2019!! 3 P.M. UNTIL ALL THE CRAWFISH, BEER, AND DAYLIGHT ARE GONE!! FOOD, DRINK, MUSIC, AND FUN!! PLEASE READ THIS ENTIRE MESSAGE, THEN PURCHASE YOUR TICKETS. THANKS!! Can you believe it? This year will be our 30th Annual Crawfish Boil!! That's AMAZING!! This event is one of the most genuine crawfish boils you will find in the Memphis area. Why? Well, one reason is that it is put on BY Louisiana people FOR Louisiana people. If you're not a Louisiana person, don't worry a bit. We'll adopt you for the day, so you'll fit right in!! Nobody is a stranger at our crawfish boil. VERY TRUE DAT!! Also, the crawfish are SPICEY!! Not the bland, poor excuse for boiled crawfish that you get most of the time at other crawfish boils around here. Your lips will be tingling with that Cajun spice! Another great thing is that your ticket includes ALL THE CRAWFISH YOU CAN EAT PLUS ALL THE BEER OR SOFT DRINKS YOU CAN DRINK!! You don't just get one plate of crawfish and then pay extra for each beer. Eat and drink all you want!! IT'S A FABULOUS DEAL!! To top it all off, the best part is that our event is held at a very unique location. Some wonderful members of our group, John & Jennifer Lawhon, offer up their property beside a beautiful pond under some big shady trees for us to enjoy. This ain't some parking lot or assembly hall. No, no, no!! When you're sitting out there, you will just swear that you have been transported back to a country setting in Louisiana. It makes for a wonderful, authentic "Louisiana" crawfish boil experience. 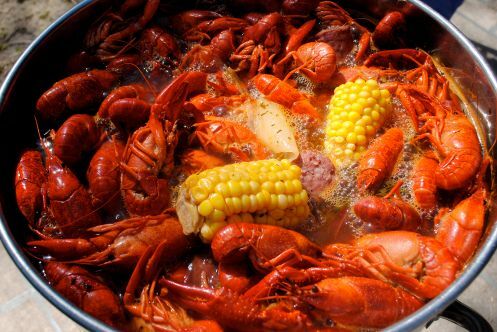 Our Annual Crawfish Boil is one of our big fundraising events that we have each year to raise money for the two LSU scholarships that we sponsor, so you're not only eatin' good, you're DOIN' GOOD while your eatin' good!! GET YOUR CRAWFISH BOIL TICKETS NOW!! We expect to sell out, so don't delay!! The Annual Crawfish Boil also corresponds with the time of year that we ask all of our members to renew their annual membership dues. Annual dues are just $25 per family. That's a very measly amount that's intended to defray the costs of running the chapter (postage, supplies, website, etc.). That way, we don't have to dip into the money raised at our fundraisers for any other purpose than to fund our LSU scholarships. We really appreciate your support of our chapter and LSU. We want to make it more convenient to renew your membership while you're buying your crawfish boil tickets, so as in the past, we are offering you a DISCOUNT on your crawfish boil tickets when you renew your chapter membership at the same time!! If you're not a member, you can join up NOW and still enjoy the discount!! We want to make this a FAMILY FRIENDLY event, so we've also added a lower price ticket for minors under 18, so it's easier AND less expensive to bring the kids. Of course, as always, KIDS UNDER 12 ARE FREE!! IMPORTANT NOTE: If you have already joined or renewed your membership in 2019, just go ahead and buy your tickets at the discounted price, and we'll refund the membership dues back to you after we verify your membership. CLICK ON THE DROP DOWN MENU BELOW TO BUY YOUR TICKETS!! DO IT TODAY! !